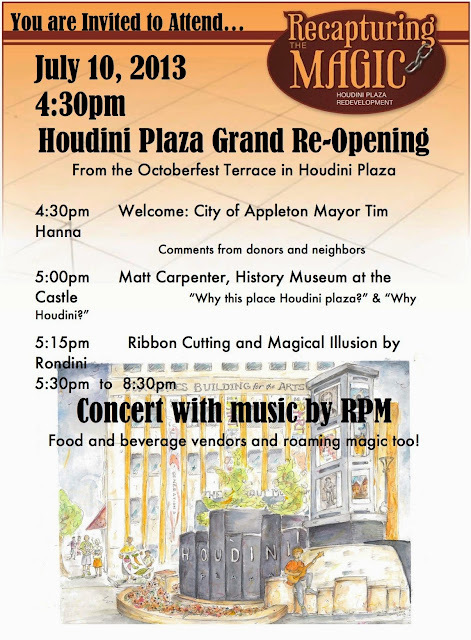 The newly redesigned Houdini Plaza in Houdini's adopted hometown of Appleton, Wisconsin will be officially dedicated on July 10, 2013 with a special event. 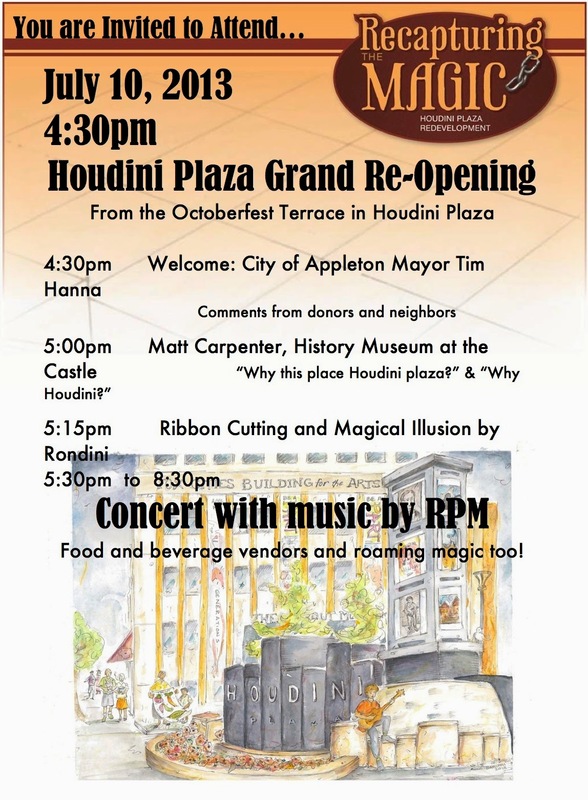 The "Houdini Plaza Grand Re-Opening" will start at 4:30pm with an address by Appleton Mayor, Tim Hanna. Matt Carpenter of the History Museum at the Castle will then give a talk on Houdini. The official ribbon cutting will take place at 5:15pm with a magical illusion performed by Rondini. Following the official dedications there will be a concert with music by RPM. The event will include food and beverage vendors and roaming magic as well. 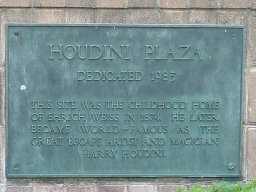 Houdini Plaza was first dedicated in 1985. The original dedication plaque stated that it was the site of the Weiss family home. Plans for the new plaza were first unveiled in June 2011. Construction on the plaza started on January 22 of this year. The city posted a webcam where you could watch the construction live (and now get a sneak peek at the finished plaza). Below is the official invitation to the July 10 re-opening, courtesy of the good folks at Appleton Downtown. 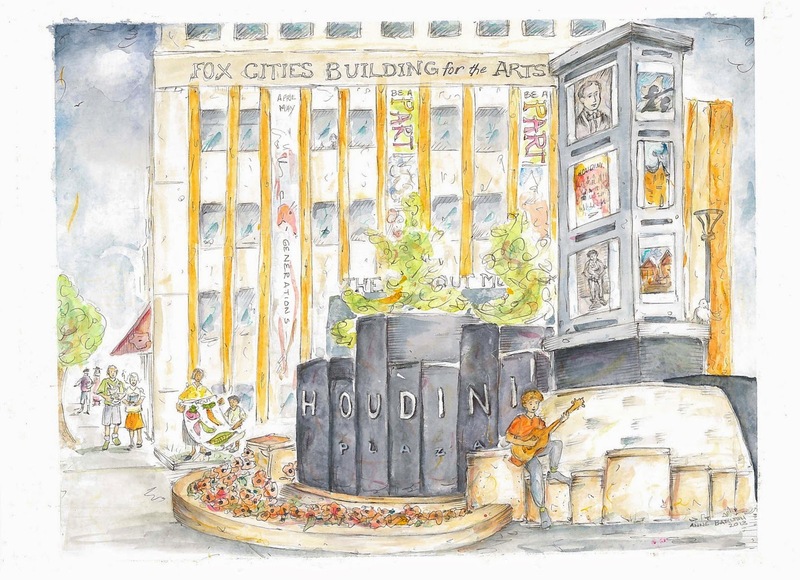 The new plaza spots a beautiful fountain with a large Houdini picture box pillar. I'm hoping to get some nice pictures of the new plaza to post after the event. Thanks to Jennifer Stephany at Appleton Downtown.